Heanjia Super Metals Co., Ltd. was originally established in 1984 and endeavored to serve the industries with high performance alloys worldwide. After doing a successful business in China, we have been settled in US since 2014 to meet the full needs of customers. We have become highly developed modern company that has become well respected within the wire industry. In our manufacturing units, we produce wide range of super alloys to exacting specifications and demands for a wide variety of applications. Heanjia Super Metals has established strategy cooperation relationship with Shougang Group and General Research Institute for Nonferrous Metals (GRINM). They are the best metallurgical enterprise and research institute in China. The cooperation relationship dramatically increased the production and research capability which gave us the capacity of offering world standard product and service. In 2012, Heanjia Super Metals united with Xinxing Nickel Wire Mesh Factory, expanding the product range to wire mesh products and further fabricated products. Meanwhile, we restructured the production and quality control system which dramatically reduced the production cost and increased the product quality stability at the same time. Heanjia serves a multitude of industries such as oil and gas energy, nuclear, aerospace and aeronautics engineering, chemical industry, military, medical, pollution control, electronics, marine and more. We offer manufacturing and value added services to meet your exclusive requirements including cut to length, welding, slitting, shaping and more. Our goal is provide our customers with the finest products and services, wishing to let our customers know “Made in China” also means good quality and good service beside of good price. We deliver customers with an unbiased level of potential in manufacturing and service of products. 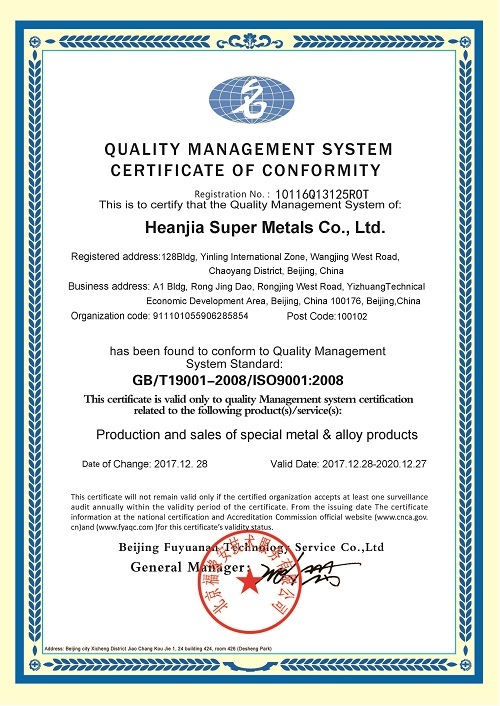 Heanjia Super Metals combines the motivation and creativity of its team with the knowledge and dedication of the engineers ensuring that each order is processed quickly and to the excellent quality. 1984: Mr. Xinshui Zhao and his wife opened factory with 3 sets of wire drawing machine in China’s reform and opening-up trend. 2005: Built and moved to new production line facility in Anping Industrial Zone. 2006: Get the exporting license to export products. 2007: Established production cooperation relationship with Shougang Group. 2008: Established research cooperation relationship with GRINM. 2012: United with Xinxing Nickel Wire Mesh Factory.